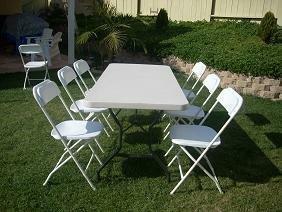 Table and Chair Party Rentals | BounceGeeks.com Richmond, VA.
Get your tables and chairs here! Select this package for six 6' long by 2.5' wide table and 40 white poly chairs. This is the maximum amount of tables and chair that our 20'x20' high peak tent can hold. Due to being used outdoors, they may have some staining, so please don't expect them to be perfect. Rental does not include setup of tables and chairs.